Over the years we had hundreds of customer requests for an epoxy accurizing compound with a butter-smooth consistency which would neither run, drip or leach out from between wood and metal after being placed in the gun stock. After many years of research and testing, we perfected a modified version of our popular Acraglas® that gives the same super accurizing bedding job and also meets those specialized smooth application features you have asked for. Acraglas Gel was designed to take advantage of the latest technological advancements in epoxy research. It has the best possible advantages built into it for those that want a butter-smooth type of Acraglas. Nylon Derivatives are formulated into Acraglas Gel and provide greater "thin strength," shock resistance and stability over normal temperature extremes. Slightly less shrinkage than that of Acraglas, which has an amazing 1/10th of 1%. 1-to-1 mixing ratio gives a stable, molecular lattice structure to Acraglas Gel that will not crack, craze or sugar-out as will other 1-to-1 epoxies. Plus, this exclusive, 1-to-1 mix ratio, by volume, simplifies mixing and measuring small amounts accurately. Slightly longer pot life to give the user more time when doing the actual bedding. Longer cure time - The molecular structure of Acraglas Gel has been controlled so that for the first few hours after the epoxy sets it remains slightly flexible, making it easy to trim away excess compound. Readily blends with atomized aluminum, steel and stainless steel particles, thus making it possible for the user to create his own reinforced epoxy whenever such type epoxy is desired. Standard mix for optimum results is 1 part metal particles-to-3 parts mixed Acraglas Gel by volume. Can be dyed the same as Acraglas to match the characteristics of the gun stock being worked on. The above features of Acraglas Gel give you an idea of how completely we fulfilled your requests for a companion product for Acraglas ... The Acraglas Gel stay-in-one-spot feature ... sophisticated molecular structure ... slightly longer pot life and curing time ... the ability to mix in aluminum or steel, make this a product we are proud to offer to you. Because of the characteristics of the lattice, molecular structure of Acraglas Gel, the advantages of glass floc are already incorporated in the finished epoxy so the addition of floc is not recommended or needed. 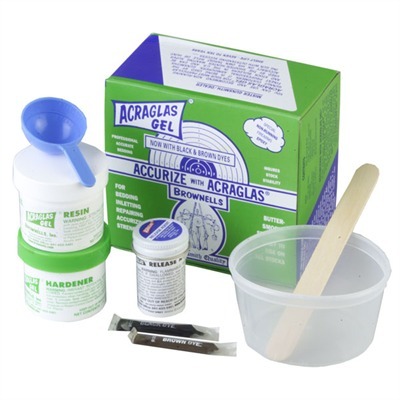 ACRAGLAS GEL KIT - 2 fl. oz. (59 ml) Resin, 2 fl. oz. (59 ml) Hardener, 7/8 fl. oz. (26 ml) Release Agent, Measuring Spoon, re-useable Poly Mixing Dish, Mixing Stick, Brown Dye, Black Dye and Complete Instructions. ACRAGLAS GEL SHOP KIT - 8 fl. oz. (237 ml) Resin, 8 fl. oz. (237 ml) Hardener, 3 fl. oz. (89 ml) Release Agent, Measuring Spoon Set, 2 re-useable Poly Mixing Dishes, 25 Wide Mixing Sticks, 3 Paks Brown Dye, 3 Packets Black Dye, Instructions.